SOCHI, Russia – My three visits to Russia have been the most fruitless three visits to any country in the world as far as my open mic journey goes. I’m on my last day in Sochi today, and I leave after midnight for an all night return to Paris. The only place I have played in Sochi on this trip is in my hotel room. I’m not totally depressed about that, though, because not only was it great to play, but I actually wrote a first draft of a new song! Still, Sochi has proved to be the least successful place for me on any of my world travels. But I think there is a good reason for this – part of it to do with me, part to do with Sochi. First, let me make it clear: I have played once in a bar in Sochi, as I note in my post from 2014 about playing in the beer garden near my hotel in Sochi. That place is still there this year, and I have eaten all my meals there, but there was no music, no band, this time. Second, I would like to add that I have done many searches for open mics or open jams in or near Sochi online, even asking for a Russian speaker to help me, and I have found nothing. So it is NOT an easy thing to do, even if you are a Russian speaker. In fact, adding to the above point, I must say that on this trip, I actually have a Russian acquaintance from Paris, who ran an open mic in Paris – and so is quite attuned to the music scene – who had a month or two warning in which he said he would help me find a place to play in Sochi, and he came up with nothing! And I forgot to mention that the reason he said this, is because he himself is here in Sochi right now! So even my Russian acquaintance from Paris who is currently in Sochi, knows music scenes, and works in the travel business, even HE could not find a place to play here! The Bruderschaft is in the background. Still, having said all of that, I must add that I myself did NOT do what I have done in just about every other country I have visited: I did not just walk the streets all over town and try to find a live music joint, other musicians, and see if I could act like a magnet and draw the music scene to me. But that, unfortunately, is partly because of the nature of Sochi itself: The immediate surroundings of where I am staying is in the former Olympic Village. It is nothing but hotels, beach, amusement park, race circuit, restaurants set up for the Olympics and then the conversion to the F1 race and tourism. Don’t get me wrong, there IS a place called Sochi outside of the Olympic Village. In fact, the place I’m in strictly speaking is called Adler. 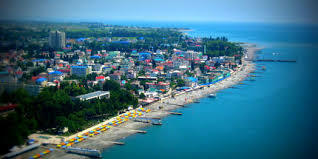 But the Sochi we all talk about happens also to cover 145 kilometers of oceanfront, in a long, long strip of vacation industry kinds of places. Sochi is the leading holiday resort for Russians, and so this is not an easy place to walk around in like some of the major cities where I have managed to find music despite language barriers and a dispersed musical culture. I can walk the streets of Nagoya or Tokyo or Istanbul or Sao Paulo or Kuala Lumpur and many many other major cities where the F1 takes me, and I can find the music. Here in “Sochi” I cannot so easily do this. In fact, I can’t really do it at all. Or rather, maybe I should be hiking down 145 kilometers of coastline trying to find an open mic or bar that has an open mic or open jam. But this is not so easy when I have a job to do also. And as I learned last year as I jogged down a portion of the boardwalk, there’s the added problem of wild dogs in Sochi, and in my experience, wild dogs dislike guitar carrying vagrants as much as they dislike joggers. Excuses, excuses. Anyway, that, so far, is the extent of my adventures in Russia this year, and so far, on all of my three visits to the country since 2014. I must try to book a stopover in Moscow sometime, as I’m about 98 percent sure that must be a different story all together. Oh, and I really must add that the part about playing in my hotel room here is really far more positive than what my state of mind was in last year’s visit to Sochi: Readers may recall that last year I discovered at the last minute that Turkish Airlines would not allow me to take my guitar on the flight to Sochi without me paying extra – about a third the cost of the guitar – and so for the first time in 7 years I did not take my guitar with me on a trip. This year, I was horrified a couple weeks before going to Sochi to learn that my Turkish Airlines flight had been cancelled, and I had to find a last minute replacement with Aeroflot. It was only after I booked that that I recalled my fiasco with Turkish Airlines, and felt lucky I could bring my guitar again this time on the much more friendly Aeroflot! SOCHI, Russia – So I’m sitting in my hotel room in Sochi, at the site of the Winter Olympics, and it’s pretty dismal outside, with lots of rain, and my work does not start until tomorrow. So what would I do right now to be playing my guitar, like I have done for the last seven years while travelling on my job to cover Formula One races. Yes, this trip to Russia is the first time in seven years that I have not been able to take my guitar on a flight to a faraway country to play in my room and seek out open mics and jams and other venues to play at. Thanks Turkish Airlines. I love Turkey, I love Istanbul, and I’ve had nothing but good experiences with Turkish Airlines. That’s why I decided to take Turkish Airlines to Sochi, since, as it turns out, it is also the cheapest way there from Paris: Paris – Istanbul, Istanbul – Sochi. In fact, the flight last night after midnight from Istanbul to Sochi was about 98 percent booked by Formula One paddock people, drivers, team staff and media. So I’m not the only one who has discovered the Turkish Airlines way to Russia (with love). But as it has been many years since I flew on Turkish Airlines, and I have my paces all set out for most of the other countries I fly to, and as I’m aware that of all of the world’s airports, Charles-de-Gaulle, in Paris is one of the most difficult ones for a musician with a guitar to pass through, I decided to check out the Turkish Airlines site for its baggage policy before I left. I was also spurred on to doing this because I noticed that in my international flight on my electronic ticket, it said I could take 30 kilograms of baggage – which is wonderful, since I’d be well under 30 kilos even with the guitar in a hard case. But I then noticed that there was a special policy for lepers. Sorry, I mean musicians. It said that if you really wanted to take your guitar onboard – i.e., if the instrument exceeded cabin baggage size – you had to buy a seat. This all seemed pretty absurd. So I decided to call up Turkish Airlines at the airport in Paris and query. They took my name, checked my ticket, and told me to wait, that they would look into it. Actually, no, they did answer one of my questions, which was, if I have 30 kilos of baggage, can I divide that into two pieces. They said I could divide it into as many pieces as I wanted, but that, oh, if one of those pieces happens to be a guitar, then I might have to pay an excess luggage fee. Off the woman went, and when she returned, she confirmed that I would have to pay about 15 euros per kilo of that excess luggage. In fact, it was NOT excess luggage, it was just a guitar. I explained that with my main bag and the guitar – which would weigh 7 kilos, hard case included – I would have a total of 24 kilos in the flight, which is well under the 30 kilos allowed. The woman told me that it made no difference, since one of the pieces of luggage was a guitar, I had to pay out of my nose for the privilege of taking it with me to Russia on Turkish Airlines, i.e., a minimum of 105 euros extra…and I’m not actually sure if I had to pay the 105 both ways, or if that covered the entire return trip. And I no longer cared, because 105 euros to take my guitar which is NOT excess luggage, for me was not just torture of a musician, it was also a sum I cannot afford. One of my journalist colleagues, upon hearing this story last night at the airport upon arrival, reminded me that he had seen me singing and playing my guitar in Sochi last year, at a pub, and that I had sung Tom Petty’s, “I Won’t Back Down.” I was impressed with his memory, but I was suddenly less impressed with myself, as I said to him that this year, I had just backed down. I had backed down from Turkish Airline’s extortionate practices against guitar carrying musicians. But on the other hand in a way, I did not back down. I was not going to let the airline make me pay a vast sum of money that they did NOT deserve. But so here I am on a rainy day in Sochi, and missing my guitar like hell. Maybe I’ll find an open mic, though, and play someone else’s guitar…. PS, Last year I did the same trip with Aeroflot via Moscow. It was more expensive, and Moscow Airport was a little too crowded for my liking. But both the Aeroflot people and the people at the Moscow Airport were super cool about my guitar, allowing me to take it into the cabin, and even, at the airport, asking me if I wanted to go up and play some music on the stage that was being constructed behind me in the airport for some upcoming concert. PPS, I keep on having these urges, where I am sitting at my computer, and I want to turn around and grab my guitar for a few chords and songs…. Have to keep stopping myself…. PARIS – I just love the Russian feel to the Escargot Underground open mic that takes place in Paris on Thursday evenings in the basement of a Russian travel agency called the Escargot Touristic Center. But even more than the Russian feel – with some Russian musicians and Russian organizer – is the feeling of a real, true, bona fide “underground” kind of open mic. There were fewer people last night than the last time I was there a few weeks ago, but the atmosphere was just as good, and in fact, the place is so small that you don’t really necessarily want THAT many people. What makes it “underground”? The music, the kind of musicians, the open hearted, open-armed greeting of all musicians and all styles, and the cave underground room where it takes place. But just mostly the attitude that anything goes, that there are no real judgments at all of a musician good or bad, and that everyone is, in fact, welcome. I’ll let the video’s do the talking for last night’s show. One of my favorites was the Russian band, which sounded a lot like some of the Russian pop music I heard while I was in Sochi in the fall…. SOCHI, Russia – Just when I thought I had finally failed for the first time ever in the last six years that I have been attending Formula One races around the world and vowing to find a place to play at each event, just at the last moment, the last night in Sochi, Russia, at the site of the 2014 Winter Olympics, that’s when I left the restaurant, walked out the door and heard the sound of live music. Suddenly, I had a hope, a last ditch, last attempt, last offering, possibility of perhaps being able to play on stage in Russia. So I looked around and saw across from the Russian restaurant where I had eaten – the Graf Orlov – and also across from the facing Italian restaurant where I had eaten on the previous two nights – the Il Bacilico – that there was a massive beer house called the Bruderschaft, and that the music emanated from within. It also turned out to be the same location where I knew some journalist colleagues had gone for a few drinks. So failing the possibility of playing music, there would at least be a bit of conversation to be had. 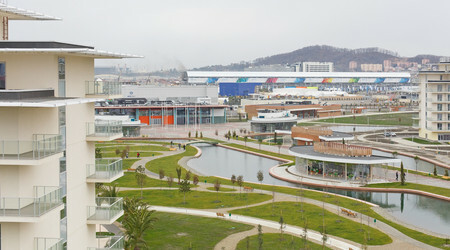 This whole complex, you must understand, is part of the Azimut Hotel on the site of the former Winter Olympics, now right next to the Sochi Autodrom Formula One circuit, where the inaugural Russian Grand Prix took place yesterday. The area was full of Formula One teams, journalists and other personnel, in addition to spectators and other Grand Prix related people. It was the same complex where I had played in my hotel lobby on the first two nights – only noted once on this blog – and while it was all very comfortable, I had realized that in choosing a location to stay near the racetrack, I had also found myself in a world without the kind of nightlife that was likely to spawn an open mic, open jam, or other open live music event. Wrong. So I walk into the Bruderschaft, and I am approached by a woman manager, and she asks if I want a table. I say, “Well, I really want to sing, play music.” “Yes, of course, you can do that.” I looked at her in disbelief, and then looked at the funny little covered stage in the middle of the beer house bar, and on the stage were three musicians: A guitarist who also sang, a man on saxophone and another on keyboards. It turned out that the man on guitar singing was just another client, and that the other two were the house musicians. It turned out, even better, that another one or two people from the public went up on stage afterwards, and when I asked if I could play and sing, the answer from the stage, too, was sure, of course. And so it was that I had discovered, if not quite an open mic…yes, an open mic. And so it was that I played “Wicked Game” and “I Won’t Back Down,” me on the electric guitar and vocals, and the keyboard player on the keyboards and the saxophone player on the sax. And boy, was it fun. Playing Russia, just when I figured I had been defeated and would for the first time not play in a new country where I was visiting for my work. I had not forced myself to take the train to the downtown, central part of this vast ocean front holiday resort area, the southern Russian holiday mecca. I had not taken the risk, despite going all the way to Russia, to go then all the way into the downtown area and spend hours searching the streets maybe only to either find nothing, or to play until it was so late I could not find my way back. After all, I had a job to do. But then, there it was, done, I’d found a place to play on stage with Russian musicians in Russia. What a blast! Hope I get to go again next year, and then I’ll search further afield. I did, by the way, check out the beachfront area of nearby Adler, which was ten minutes away in a taxi. But it was so stretched out in area, also, that trying to sort my way around all the many bars and pubs and music joints, as just too bit a thing to do in a single night. I was in Sochi for around five nights, but the logistics after choosing the Olympic Village as my hotel area, were just not up to it. In any case, there it was, on my doorstep from the beginning. At the Bruderschaft in the Azimut Hotel area in Sochi. And the open armed, open mic policy of the musicians and the management, was just like what I find everywhere else in the world, when it comes to music joints and vibes. Check it out! SOCHI, Russia – Arrived in the former Sochi Olympic village late last night after a long day of travel from Paris – which followed 33 hours of travel the previous day from Japan – and found myself with a very limited amount of time to get a meal. So I ran over to the nearest restaurant, carrying my guitar on my back only because it contained my evening’s reading material and my computer and other bits and pieces that I had no time to unpack. I ate a wonderful meal of beef Strogonoff and had some Russian red wine along with it. Had some nice conversation with colleagues and returned to the hotel, still with my guitar on my back, but at around 1 a.m., I figured there was no point at all in seeking out any kind of musical venue – especially in this former Olympic Village environment. But as I entered the hotel lobby, I had to ask the man at the front desk if there had been any work done on my non-existent wifi connection in my room, and when he said “no,” I decided to sit there and do a bit of Internet stuff, since the wifi worked in the lobby. That’s when that man asked me about my guitar. I decided to take it out and show him my guitar; then I asked if it was empty of guest rooms on the ground floor, and he said it was. So I decided to sing a song. We were joined by the security guard, and it turned out he is a bass player, so he wanted to see my guitar. SO then he played a bit, and then I played a bit more, then I played a bit more than that, and soon we were having a kind of open mic…. The pop star’s name is Andrei Makarevich, and everyone knows him here. But what I did not learn about him until I got to the racetrack today and met a Russian journalist friend, is that Andrei Makarevich is now no longer well-loved by everyone, because he is considered far too pro-American…. And so just when I thought I was finding a place without politics…. Anyway, it was a fabulous first night, and a real eye-opener. And I was delighted to have a place to play, even if it was just the hotel lobby… and even if I was helped by the Russian red wine…. PARIS – The Escargot Underground open mic in Paris started last year some time and then ceased, and then recently started up again. That’s a kind of escargot movement, when you think of it. 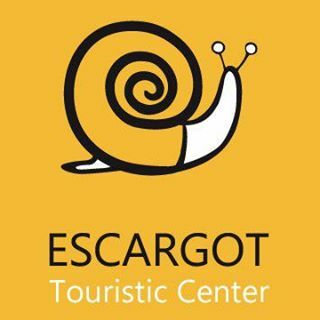 And escargot means snail in French… but this open mic takes place in the cave basement of a ground floor office for a Russian tourist agency called Escargot Touristic Center. Now that you get the meaning of the name, how about a sense of the place? Given that the temperature in Paris was around 35 degrees celsius yesterday, a visit to the Escargot open mic was a great relief; the cellar is a classic Paris brick vaulted room, which means it is very cool in temperature, and just what was needed to counter the suffocation of the airless heat of Paris. It is also the kind of room where amplification is not really necessary, and some people played without it. There were a few familiar musicians, like John Redford and Brislee Adams, and Raphaelle Bouskela. But there were some I did not know, including one of the two Igors present, who did his Russian music along with another Russian on bass, and changed the atmosphere into that of a Russian expat gathering for a few minutes. The other Igor, whom I met at the open mic at the Blanchisserie in Boulogne, by the way, I learned is apparently the member of a well-known Russian band from St. Petersburg. Wish I’d heard them play…. As it was, because the emphasis was on cooling off and slowing down and not really doing loud music, I decided to change my repertoire a little, and I sang “May You Never,” by John Martyn (without the incredible guitar work that makes that song so amazing), and the “Raggle Taggle Gypsies,” of Irish/English tradition, as well as “Just Like a Woman” and my own “Except Her Heart.” Thanks to Brislee and Raphaelle for the videos of me – although I think I made a mistake in every song I sang!!! A very cool evening, cooling off in the Russian travel agency Escargot….